If Joseph Campbell had written children’s books, I think his creations would have been a lot like those of Paul Owen Lewis. Paul Owen Lewis writes books which urge his readers to follow their hearts, to embrace both the mystery and self doubt found there, and ultimately, discover the one path which is right for them alone. Sometimes, Paul Owen Lewis’ characters hear the call to self from inside their own hearts and know it will not pass, or let them rest, until it is acknowledged. Davy is a boy who wrestles with his dream to sail with orca whales. An idea which is openly mocked by the old fishermen at the pier. Instead of retreating from his dreams, Davy allows himself to be completely swallowed by them. In return, he discovers how to make his dream come true and saves his life in the process. 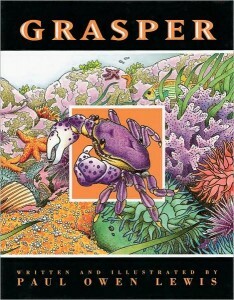 Grasper is a crab who can’t ignore the pull in his heart for something bigger. After Grasper molts for the first time, all of the other crabs warn Grasper to ignore his heart’s crazy thoughts. These feelings will pass, advise the other crabs, once his shell and heart harden. In the end, Grasper finds the courage to listen to his soft heart. He scrambles over the rocks and discovers a huge world full of much larger risks and rewards. After a few seasons, Grasper has grown bigger, large enough to match his new world. In other cases, the characters from Paul Owen Lewis’ books heed the call to greatness from outside of themselves, and in order to survive, must welcome it with bravery. Storm Boy goes fishing alone to gather food for his village. A violent storm takes him to the bottom of the sea where he is welcomed by a great and mysterious people. Unafraid, Storm Boy dances and exchanges stories with this wondrous clan. Finally, when Storm Boy becomes homesick, the great underwater king transports him back to his family. Storm Boy receives a hero’s welcome, and gladly shares the knowledge he gained during his adventure with his people. Frog Girl listens to the frogs at the lake. One day the frogs are silent and Frog Girl is sent on a special mission to rescue them. She travels to the bottom of the pond, consults with a powerful frog spirit, survives a volcanic eruption, and in the end, rescues the missing frogs. Most importantly, Frog Girl is given the hero’s opportunity to share with her people the sacred knowledge that all living creatures are kin and should be treated as brothers and sisters, not objects for cruel sport. If Joseph Campbell were alive today, I can’t help thinking the books of Paul Owen Lewis would have been praised by Campbell–in much the same way as Star Wars was in the Power of Myth Series—as a superb examples of new modern myths. Paul Owen Lewis has created the stories which not only speak to our contemporary hearts, but provide guidance for our troubled times as well. No small accomplishment, I would say. Previous Previous post: Good Thing Seattlites Are Recycling All of Those Plastic Bags……. Next Next post: Seattle is Not for Sale | Seattle Green Bag Campaign…….